I just have to say that I liked this movie a lot more than I thought I would. I thought I would like it, sure. I knew I’d get a few laughs, but, I had no idea that it would be this good of a movie. 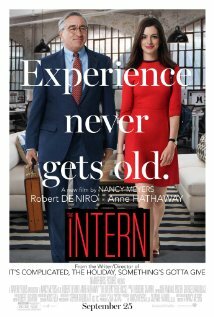 The Intern stars De Niro as 70 year old retired Ben. Ben worked for many many years as a business man, is now a widower, and doesn’t know what to do. Along comes a senior intern program for the fast rising business run by fast talking, fast working Anne Hathaway. De Niro and Hathaway make this movie what it is. The relationship between these two is amazing (not once do you think they will have a weird romance relationship so that’s really good). What I really liked is the sense of humor in this movie. Everyone knows it is funny that he is 70 working for a 30 year old, they touch on it a few times but that’s it. Most the jokes come from De Niro fitting in seamlessly with the 20-30 year old hipster-ish people, teaching them how to be a gentlemen, and being an all around amazing guy… Towards the beginning of the movie I noticed a lot of familiar faces popping up. Not A-list actors, or B-list actors, just random actors I’ve seen around and I liked that a lot too. All in all this was a great movie. It was funny, it had heart, and it’s VERY re watchable. The only gripe I have is it feels a little long, but personally I’d like this to be a TV show!